Hello, Friends! Were you thinking...get ready for what? Yes? Well, it's time to get ready for the TENTH 30 Day Coloring Challenge, hosted by my sweet friend, Kathy Racoosin! This challenge will begin on June 1st and run through June 30th. 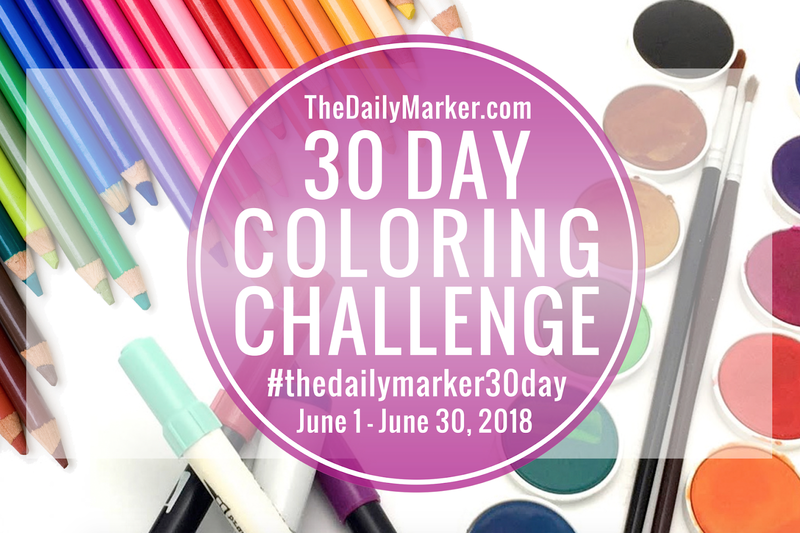 The coloring challenge is a fun way to carve out a small bit of time to relax and do something we LOVE...color! Color a little, color a lot. You can color in a coloring book, you can color in stamped images, you can watercolor or do some ink blending, it's up to you. There is only one rule...FORGET all the rules and just have fun, fun, fun! Kathy will have a daily post to inspire us, along with prizes and giveaways, so make sure you visit her blog, The Daily Marker every day. And remember, you don't have to participate each day, just jump in when you can. This is for fun and relaxation. Absolutely NO PRESSURE or STRESSING OUT! Okay? Okay! When you do color something, please share it on social media using the hashtag #thedailymarker30day that way we can see your artwork. If you're new to the whole coloring challenge event, please click HERE for more information. Oh yay!! And I'm off for summer break. Yippeeee!! !